Microsoft has released the Windows 10 Technical Preview and Preview for Enterprise this week. 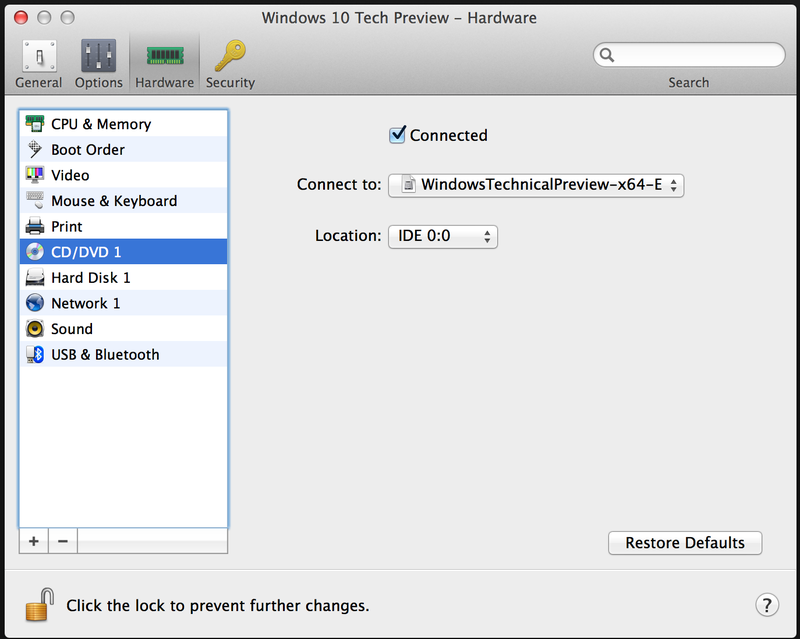 If you’re like me and you use a mix of Macs and PCs, you may decide to run the Technical Preview using some sort of virtualization software. In my case, I was trying to install the preview with Parallels Desktop 10. During the install, it was asking for drivers before the install could continue. Turns out the fix for this issue is a very simple one. Instead of using a SATA DVD drive in the VM, change the DVD drive to use and IDE drive, as illustrated below. Today, Microsoft have released the Windows 8 and Windows Server 2012 release candidate (or Release Preview) builds to the public for testing and feedback. I’ve compiled a list of the downloads that Microsoft has made available. If anyone has anything to add, leave a comment and I’ll add it to the list. If you are a Small Business Server 2008 or 2011 user, you have Internet Explorer 9 installed on your server, and you try to close the Exchange Management Console, you may encounter an error similar to the one listed below. Microsoft has released a fix for this issue and I’ve included the download links below. In order to install this fix, you must have the latest updates installed from Microsoft Update as of October 11th, 2011. If you have not updated your server(s), do so before installing this patch. If you are not experiencing this issue, it is advised that you don’t install this patch, as it has not been as thoroughly tested, and is planned to be rolled up into a future Internet Explorer update. Technorati Tags: Exchange,Exchange 2007,Exchange 2010,Exchange Management Console,IE9,Internet Explorer,Microsoft. Over the course of the last six months, I have been using Internet Explorer 9 in its various forms (platform previews, beta build, release candidate build) and have come away very impressed with the job that Microsoft has done. Internet Explorer 9 is the newest addition to the Internet Explorer family. With IE9, Microsoft has sought to make IE standards compliant, faster, cleaner, and provide a trusted browsing experience. In this review, I’ll dig into each of these categories. For years now, Internet Explorer has somewhat been the bane of every web developers existence. Previous versions of IE have not supported web standards very well, and developers have had to resort to performing magic to get their websites to render properly in IE and across other browsers. With the release of Internet Explorer 9, Microsoft has made strides in standards compliance. On the Acid3 test, produced by the Web Standards Project, Internet Explorer 9 scores 95/100. According to Microsoft, they don’t score a perfect 100 because two technologies SVG Fonts and SVG animation are in transition. Compared to IE8 though, IE9 is leaps ahead. IE8 only scores a 20/100 on the Acid3 test. A buzzword (in my opinion) that you’ll hear is, HTML5. HTML5 is the next evolution of the HTML standard. HTML is the language that all webpages are written in. The reason I call it a buzzword is that HTML5 is not a complete and ratified standard. There are many pieces that are still being developed or are in transition. However, Microsoft and all the browser vendors will be talking up HTML5 and hopefully someday soon it will go from a moving target to a ratified standard. Internet Explorer 9 is the first web browser with native hardware acceleration. By leveraging APIs in Windows 7 and Windows Vista, Internet Explorer 9 is able to take advantage of the computing power found in the CPU and in the GPU. What this means is that instead of web pages feeling flat and lifeless, the web comes alive and endless possibilities abound. Online gaming is faster and smoother, watching videos is no longer a chore, audio sounds better, and text appears with more clarity. Hardware acceleration makes web sites feel less like websites and more like web apps. Using demos available from Microsoft’s Beauty of the Web website, I was able to test the performance of my laptop with IE9’s hardware acceleration features. The addition of hardware acceleration to the browser has brought IE9 light-years ahead and greatly enhances the web browsing experience. Internet Explorer 9 has a new and different user interface. Gone is the clunky interface of old, and in is the clean, streamlined interface. In IE9 the concept of the OneBar has been introduced. Instead of having an address bar and a search box, the two have been combined. Searches can be performed from the search engine of choice, and browsing to websites is still easy as ever. By default, tabs now appear on the same line as the OneBar, but can be moved to a second row if so desired. By reducing the size of the browser frame (area around the website), webpages have a greater display area, and more can be done with less scrolling. I personally was never a fan of the address bar, the favorites bar, the tab bar, etc., that appeared in previous versions of Internet Explorer, so the new slimmer IE9 is welcome sight. Internet Explorer 9 also introduces the concept of Pinned Sites. When I was first introduced to Pinned Sites, I was immediately excited. With Internet Explorer 9 and Windows 7, you can take websites and pin them to the taskbar. By pinning them, they behave as if they were their own application. The browser frame takes on the color scheme of the websites icon, and if supported by the website, provides easy access on the Jump List to common tasks. Internet Explorer 9 is a much welcome release from Microsoft. By finally supporting web standards, Microsoft has recognized the importance and the future of the web. As web based applications and cloud computing take hold, having a web browser that supports the technologies being used is increasingly important. I strongly recommend downloading and installing Internet Explorer 9 and trying it out. If you’re a diehard Firefox supporter who swears off IE, please give it a try. There are numerous improvements to the browsing experience with IE, and so many cool new features, testing is warranted. Internet Explorer 9 is safer, faster, better looking, and all around a nicer browser to use. To find out more about Internet Explorer 9 click here. Tonight from SXSW (South by Southwest) in Austin, Texas, Microsoft has announced the general availability of Internet Explorer 9. Internet Explorer 9 is the next generation of web browser from Microsoft and supports web standards and is the first web browser to have full hardware acceleration. IE9’s new user interface is a radical departure from the Internet Explorer of years past. It is simplified and takes the focus off the browser and places it on the browsing. With the new Pinned Sites feature, websites become apps. IE9’s navigation and frame take on the color of the website’s icon, creating a unified experience. IE9 gives web developers access to Jump Lists in Windows 7, enabling them to enhance their websites by providing easy access to common tasks on the Taskbar. Internet Explorer 9 is a secure, trusted browser. With new Tracking Protection functionality, IE9 lets users take steps to prevent information from being shared with websites. ActiveX filtering to prevent rogue ActiveX controls from compromising the PC and keep users safe and secure. If you are a web developer and are looking to take advantage of Internet Explorer 9’s unique feature set, you’ll want to check out this tool. It’s called X-Icon Editor and was shown off today at Microsoft’s Professional Developers Conference in Redmond, Washington. The editor supports importing from .jpg, .ico, .bmp, .gif, and transparent .png, live drawing or editing, online preview on IE9, and support for high resolution icons.